The recent teacher strikes in Arizona, Colorado, and West Virginia highlight a common problem: education spending is stagnant or in some cases decreasing. If teachers working multiple jobs to make ends meet isn’t bad enough, here’s worse news: skyrocketing benefit costs, such as healthcare and pensions, are consuming an increasing share of K-12 education budgets. In a new report, “Benefits Take Larger Bite out of District K-12 Budgets,” I analyzed district education and benefit spending from 2005 to 2014. The results are troubling. Over that ten-year span, benefit spending increased more than 22 percent nationally. K-12 spending, on the other hand, grew less than 2 percent. As a result, more than $11 billion fewer dollars made it to classrooms in 2014 compared with 2005, after adjusting for inflation. The problem of rising benefit costs varies significantly by state. 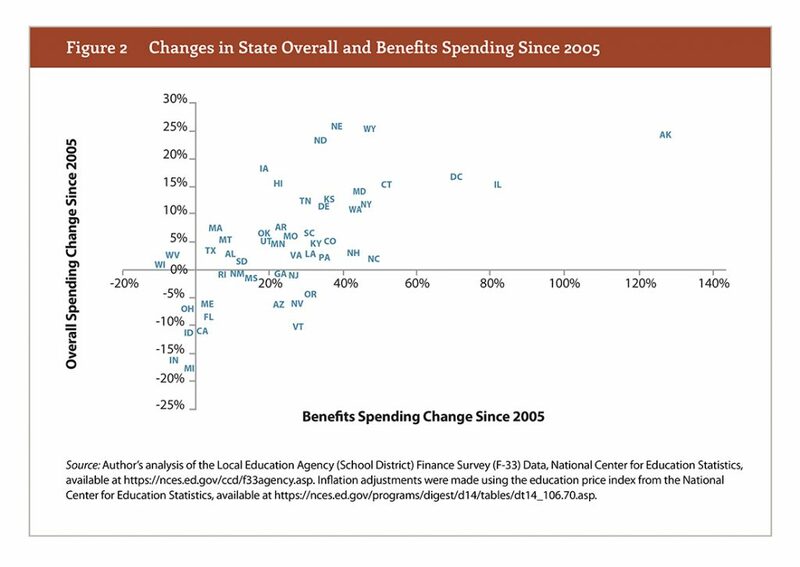 As shown in the graph below, in the vast majority of states, benefit spending grew far faster than education budgets overall. In North Carolina, for example, benefits grew 48 percent while the state’s education spending only increased 2 percent. The problem persists even in states like Michigan that cut both K-12 and benefit spending, because they weren’t cut at the same rate. The Wolverine State cut education spending by 19 percent, but benefits were cut by only 2 percent. As a result, benefits eat up an even greater share of Michigan’s education budget than they did previously. Barring a dramatic change, the problem of ballooning benefit spending will only get worse. Due to many states’ histories of underfunding their pension systems while simultaneously increasing the generosity of the plan, costs will continue to rise. Legislators will need to find politically viable solutions that both meet existing obligations and mitigate rising costs going forward. This entry was posted in School Funding, State Education Policy, Teacher Pensions and tagged school finance, state funding on August 23, 2018 by Max Marchitello.